This article is a short summary of Mario & Luigi: Superstar Saga. This article is about the original game. For the remake, see Mario & Luigi: Superstar Saga + Bowser's Minions. 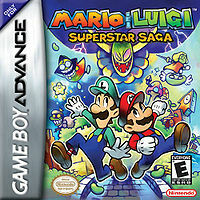 Mario & Luigi: Superstar Saga is the first instalment of the Mario & Luigi series. This article or section contains spoilers, revealing important information about the game's story line. If you do not wish to read it, skip ahead to the next section. Envoys received from the Beanbean Kingdom to Peach's Castle. The two people were Lady Lima and the Advisor. However, they took the voice of Princess Peach which was revealed to be Cackletta and Fawful. All Toads fear them as they ran away from the castle. One of the Toads ran to the Mario Bros. House for their help to rescue the princess.